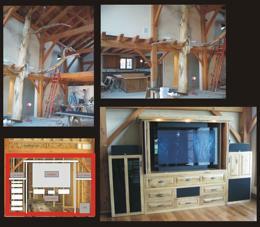 This project above began with the installation of our client's custom home integrated system. I entered the project designing the media center. The wall where the media center is located was originally called out for a fireplace. Now the area contains the AV equipment, lighted displays, hidden speakers and media storage. The dining room pieces followed the next year as did the bursts of color throughout the home. The project continues with floral works, art purchases and placement. 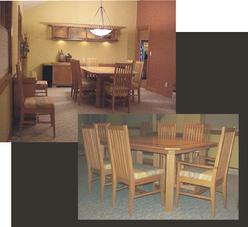 All furniture pieces are natural oak with inlays found on the dining room pieces. Floor standing speakers became part of the buffet. below...Two single units for freestanding flat panels, audio equipment and storage drawers. One in walnut and a corner unit in maple and cherry. 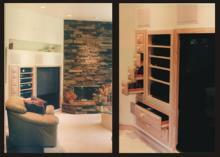 below... a build out dry wall unit resolves an awkward line of sight for the TV and audio listening. It also breaks up two areas of the room. A massive scale, natural cherry piece seen above spans two floors. The cabinet houses all AV equipment, storage, and special collectibles. The second floor area was notoriously dark. The large lighted display area resolves this issue nicely. 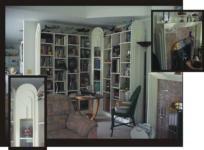 Seen at the right... we had previously installed a theater system in this home years ago. It was time to upgrade with a Pioneer Elite Plasma, all new electronics and a new cinema cabinet. A natural cherry cabinet with natural oak details now holds all their new toys and media. This room needed special treatment for the rear channel speakers. A cabinet was designed to hold these speakers and positioned in front of the stairs. Again, this cabinet includes media storage. The following year I designed a coffee, end table, and buffet piece- all in natural cherry. All with lots of storage of course! This is a dark room- great for a theater room but bad for displayed art works. I brought in my electrical contractor, and we quickly solved that issue. Lighting is so important in any room. 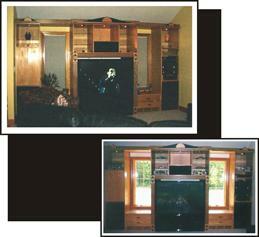 A group of mossy stained maple cabinets were designed and built for this home theater system. The clients will use this room for entertaining in addition to occasional movie watching but did not want a TV in the room. A motorized, drop down screen and ceiling mounted projector would be the solution to this project. The cabinets house electronics and media. A grouping of art works will be hung on the blank wall. 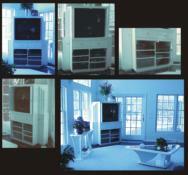 The AV cabinet with media storage, seen above, needed to assimilate with the white decor. The cabinet was painted with multiple layers of automotive paint giving a hard, glassy surface. The bookshelves and fireplace project for another client again warranted this rich finnsh for the art deco inspired decor. 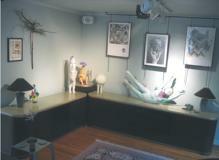 The focus on this cabinetry was a display for the sculptures. The units house electronics and media storage with lighted interiors. The flat panel is located at the opposite end of the room. The cabinets feature African brae wood for the tops and black zebra bases. My services have become an asset to our store, The Speaker Shop. Installing integrated house systems or simply one room theaters, our clients often required some type of "entertainment unit". My design process now includes furniture from media centers to fireplaces. In addition, art placement and interior design incorporates many of these jobs. Here is a sampling of some of my commissioned jobs. seen above...a unique home with a tree "growing" up through the living room. 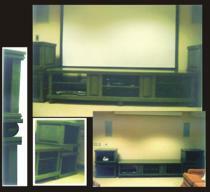 Along with the installation of a integrated house system, my task involved designing an AV cabinet for dual purposes. It contains the theater system and a professional DJ system complete with dual turntables...... 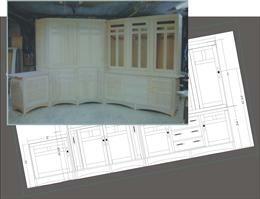 It was a good challenge to design this hickory cabinet due to constraints of the space allotted. Again, creative energy of audio and design merged.....Sound is distributed throughout this bachelor's contemporary condo. The loft area features a recessed, lighted media center with storage. The area where the TV is placed was designed to "grow" with flat panel technology- the center is removable. 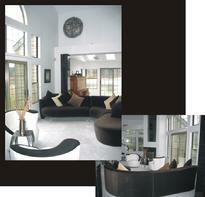 Also designed were tables, including a sofa table with custom stools overlooks the living room. The loft pieces and the computer desk on the main floor were constructed of natural cherry with mahogany details. 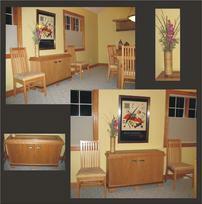 Along with furniture design services, interior design, and art from the gallery were employed. below... is a built-in cabinet of pickled oak. A large walk in closet behind the wall allowed this unique solution to obtain additional floor space creating a clean look. 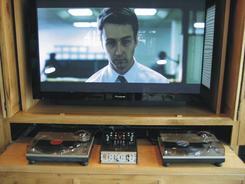 Home Theater Systems Are Not The Only Systems To Receive Custom Treatment! There are a number of our customers that remain true to 2-channel audio systems. In addition to a dedicated theater room they have a music only listening room. 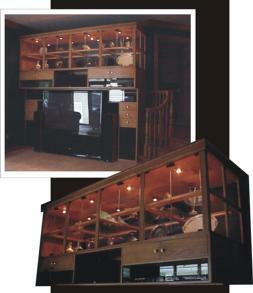 The units above were designed for entertaining and lots of storage. One unit is in a golf themed room- the knobs used are the owner's favorite golf balls! The pair of cabinets seen right were specifically designed with "tusks" featuring the owners elephant collection while housing his speakers. This ongoing project entailed dining room cabinetry in tiger maple, cherry and granite. Elements flowed into the open living area below with side tables, a wet bar and sprawling display cabinets. A coffee bar in adjoining kitchen pulled the look together. 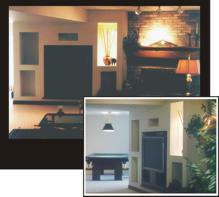 When you require a creative solution to your lifestyle.... call or email today!